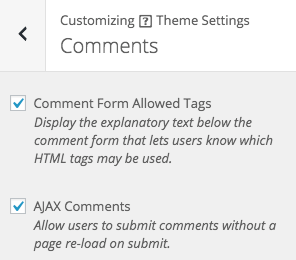 Comment related settings can be found at AppearanceCustomizeTheme SettingsComments. To remove this information from the bottom of the comment form, disable this setting. AJAX Comments, a feature of Puro Premium, ensures that when users leave information out of the comment form or incorrectly fill out a field, they won’t have to leave the page to receive the error message. This feature also ensures the user doesn’t leave the page when submitting a comment. It’s a nice little addition that helps keep comments flowing and your site looking a little more professional. AJAX comments are turned on by default for Puro Premium. If you’re using Puro Free and would like to review the premium offer, navigate to AppearancePuro Premium from within WordPress.